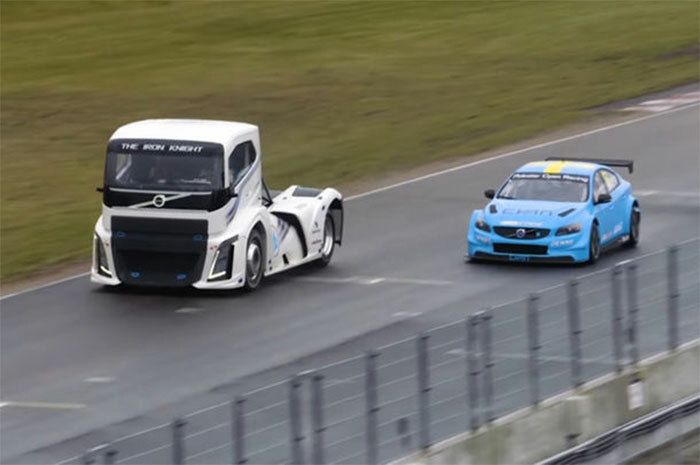 Volvo has taken a very cool way of showing just how awesome its Iron Knight race truck is. It has spitted the big rig against an S60 Polestar TC1 race car. The massive big rig in a quad-turbo diesel that makes 2400 hp and 4,425 lb-ft of torque. That is literally all the torques. Iron Knight can reach 62mph in 4.6 seconds. It’s hard to imagine a massive big rig accelerating that fast. The S60 Polestar TC1 on the other hand makes 400hp, seemingly scant compared to the truck. However, it can reach 62 mph in the same 4.6 seconds. The two lined up for a head to head race and the run is impressive to say the least. To see a big truck beating up a race track is incredible. You will want to see the video for yourself.